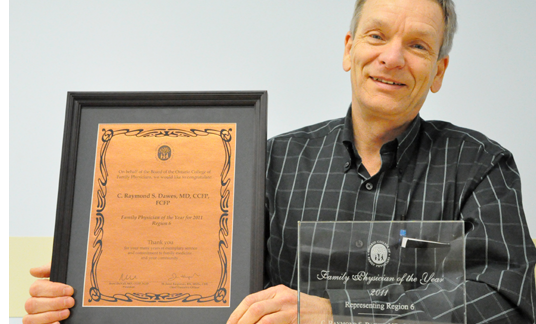 BARRY’S BAY – A Barry’s Bay doctor is one of six physicians in Ontario to win a prestigious annual provincial award. Dr. Raymond Dawes received the news late 2011 that he was the recipient of the Physician of the Year Award in Region 6, which encompasses Cornwall to Barry’s Bay, and everywhere in-between. The certificate and trophy were handed out by the Ontario College of Family Physicians, which oversees the continuing professional development and the maintenance of high standards of medical care and education in family practice. The OCFP represents more than 9,300 family physicians in Ontario. Dr. Dawes attended the 2011 President’s Installation and Awards Ceremony at the Toronto Metropolitan Hotel on November 24 last year to accept his award. He was chosen as a recipient after being an advocate for rural healthcare for more than 20 years now. While he noted that while the OCFP normally gives the award to educators, professors and people who do research, those who are vocal advocates qualify for the award as well. “I think most of us, when we get deeply involved in something; we sometimes wonder whether it has been worth it and whether your efforts have been recognized. So when you do get an award like that, it’s very satisfying and reassuring that your work was worthwhile,” he said. Dr. Dawes was born in Ottawa and grew up just south of the city. He became interested in medicine at a young age. “I was quite fascinated with the whole thing. I guess that’s when it first started,” he said. He graduated from Queens University in 1976 and completed his family medicine residency at Queens in 1978. He moved to Winchester, where he operated a family practice for 15 years in the small farming community. But, the town grew to become almost a suburb of Ottawa, and he wanted to make the move to a more rural area. He met Dr. Chapeskie at St. Francis Memorial Hospital, who was retiring and looking for a doctor to take over his practice. “Everything seemed to fall in to place,” he explained. For 19 years now he has been running a family practice in Barry’s Bay. Like several of his colleagues, he has worked in the emergency department for countless hours and even helped deliver more than 500 babies when the hospital provided labour and delivery care. Every now and then, he will even do house calls. Dr. Dawes served as Chief of Staff at St. Francis, is currently a director of emergency services, and has served on many hospital committees. He was a member of the Board of the Ontario Medical Association for seven years and has served on numerous OMA committees. He is past chair of the section on rural practice and is an active member of the society of rural physicians. This story continues in the January 19 issue of The Valley Gazette.